When I was contacted about a month ago to see if I’d be interested in examining a review copy of the upcoming The Ice Dream Cookbook by Chef Rachel Albert-Matesz, I have to admit I was a bit hesitant at first. Despite my weak-kneed response to most sweets, I’ve never been terribly smitten with frozen desserts, though I do enjoy a scoop or two every summer (and used to LOVE those chocolate-dipped soft-serve cones we get here from the ice-cream truck that jingles along the streets in summertime). Then I found out that Rachel is a natural foods chef whose recipes are very much in line with my own and the NAG diet. When I asked whether there were enough vegan recipes for me to try, she responded that virtually all the recipes in the book were already vegan or easily adaptable. In addition, all were gluten free and naturally sweetened. Well, how could I resist? The Ice Dream Cookbook is actually Albert-Matesz’s second book, on the heels of The Garden of Eating: A Produce-Dominated Diet and Cookbook (2004), which won both the USA Book News for “Best Cookbook 2004” and the Glyph Award for “Best Cookbook” 2005. She’s also written for the likes of Natural Home, Living Without, Yoga Journal, Oxygen Women’s Fitness, Muscle & Fitness, Veggie Life, Vegetarian Times, Vegetarian Journal, and Macrobiotics Today, among others. Both a cooking class instructor and a faculty member at the Southwest Institute of Healing Arts in Tempe, Arizona, she also hosts a healthy food segment on the show “Your LIfe A to Z” in Phoenix. Clearly, this woman has had quite a bit of experience developing recipes, so I had very high expectations for the ice dream creations in her book. I’m happy to report that they didn’t disappoint. The book is more than just a collection of recipes, however. Starting with the introduction in which Albert-Matesz outlines her path toward healthy cooking and how she came to write a frozen dessert cookbook, The Ice Dream Cookbook offers a wealth of information for anyone who’s interested in making frozen desserts–or any desserts, really. Chapter One (“Essential Ingredients and Shopping Tips”) outlines the dangers of sugar and (for some) gluten as well as other questionable foods, along with an exhaustive glossary of preferred ingredients and shopping tips. In Chapter Two, she describes the equipment you’ll need to make your own ice dream, from the many varieties of ice cream maker (electric or manual), right down to the bowls and knives that are best. The following chapter covers techniques for measuring and mixing to ensure your success when you whip up the frozen desserts. From there, it’s on to the multitude of flavors–and recipes! Starting with basic varieties such as vanilla, chocolate or cinnamon ice dream, the book then moves on to more exotic fare such as Avocado, Macaroon Madness, Lemon Cookie Crumble, Green Tea, Chunky Chestnut, Carob Banana, or Mango Orange flavors, among others. I couldn’t resist trying one from almost every section (and it was a difficult choice, indeed). The book wraps up with three additional chapters, with recipes for accompaniments to your ice dream: Sauces, A La Mode (pies, tarts, etc.) and Additional Indulgences (cookies for ice dream sandwiches and other confections). Overall, I was immensely impressed with the book and really enjoyed whipping up the frozen treats. Because I use a Donvier hand-cranked (non-electric) ice cream maker, my only frustration was having to re-freeze the ice cream container between batches! With all these recipes for amazing desserts, who wants to wait 24 hours before trying out another flavor? This was the first recipe I attempted, and I was amazed at how soft and scoop-able the dessert was, even days after being placed in the freezer. In this case, I used the lowest proportion of sweetener suggested in the recipe (a range is given), and while we certainly enjoyed the result, I think I’d opt for more sweetener next time (the recipes all include some stevia–I assume to reduce the amount of agave or honey–so I might just play with using all-agave instead of the stevia next time). The combination of tangy apricot and chewy pistachio is brilliant here. Anyone who reads this blog regularly knows I love avocado (and even devoted an entire Lucky Comestible series to it! ), so I found this recipe irresistible. The avocado lends a creaminess and silkiness to the dessert, and with the combination of chocolate chunks (one of the variations provided), it’s truly addictive. This one didn’t last long! Not wanting to neglect the “basic” flavors, I chose (of course) chocolate. 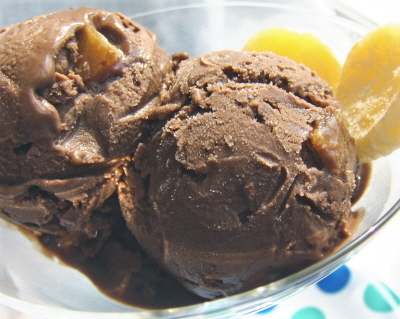 This recipe is made with cocoa (there’s another made with dark chocolate) and was just delicious. By this time, I was feeling pretty confident, so just threw in my own addition of chopped candied ginger, for a truly winning combination. Given my limited experience with gluten-free flours, I thought it would be fun to try out one of the baking recipes in the book. These crackers were easy to prepare and baked up beautifully. Mine came out a little too crispy to eat on their own, so I’m wondering if I overbaked them (the recipe does caution against letting them crisp too much in the oven). The flavor was lovely, though–just like “regular” graham crackers. And they’d be perfect for an ice dream sandwich, in which they’d absorb some of the moisture from the filling without becoming mushy. This last recipe was hands down our favorite here at the DDD household–even The Girls got a teeny lick off my fingers (“Thanks, Mum! Say, is there any more of that stuff around?”). The combination of creamy coconut milk, smooth and velvety bananas and tart lime was incomparable. And with banana and a dash of rum in the mix, the dessert never freezes to the point of solid, so it’s soft and easy to scoop no matter how long it’s stored. Which was a good thing, because we scooped aplenty. Rachel was kind enough to provide the recipe for this lovely treat, so you can help yourselves to a sample dessert from the book as well. What a fabulous way to cap off the summer! The Ice Dream Cookbook is available through Rachel’s blog. Here’s a grown up version of banana ice cream that I almost left out of the book. Don and I weren’t impressed with it, but we didn’t want to toss it. So I gave it to a few friends. They raved about it. In fact, two little boys wouldn’t let their parents have any of it. Banana lovers, judge for yourself. If you don’t like liqueur, try the variation with rum flavoring or try the Roasted Banana Ice Dream. Note: If using bottled lime juice, taste it before you use it. If left to sit too long in the refrigerator, lime juice (as well as lemon juice) can develop a strong bitter flavor. Garnish with coarsely chopped macadamia nuts and fresh or frozen (but thawed) sweet cherries or the Cherry Sauce. 1. Grate the zest from the limes using a microplane or the small holes of a cheese grater. Set aside. 2. Juice the limes and add to a small saucepan. Slowly sprinkle with gelatin or agar agar powder. Let stand for 2 minutes until it softens and dry spots disappear. Warm over medium-low heat, without stirring, until gelatin or agar agar dissolves. Scrape the mixture into a blender, Vita-Mix, or food processor. Cover and process until smooth. 3. Add the honey or agavé, sea salt, and stevia. Blend. Add the coconut milk, banana, lime zest, and rum, or rum flavoring. Blend until smooth, stopping to scrape the sides with a spatula. For a sweeter taste add an additional 1/8 teaspoon stevia and/or 1 tablesppon honey. Blend, taste, and repeate if needed. 4. Pour into one or more wide mouth jars. Cover and refrigerate for at least 6 hours before churning. 5. Scrape the chilled custard into the canister of your ice cream maker. Churn according to the manufacturer’s instructions. 6. Serve immediately, or spoon into several 8- to 16- ounce freezer-safe containers. Cover and freeze for 3 or more hours for a firmer texture. 7. Soften solidly frozen dessert in the refrigerator for 45 minutes or on the counter for 20 to 30 minutes before serving [note: I found this step wasn’t necessary with this particular recipe]. Lite Banana Daiquiri Ice Dream: Replace half of the coconut milk with lite (reduced fat) coconut milk. Alternatively, use 100% lite coconut milk, but plan to use the batch immediately or within 24 hours before it becomes hard and icy. Strawberry Daiquiri Ice Dream: Replace bananas with fresh or frozen (but thawed), unsweetened strawberries and their juices. Adjust the sweetness with 1 or 2 more more tablespoons honey or agavé nectar as needed. * For those who might be wondering, yes, I tried all these sweets before I started my current ACD! Wow–I have always wanted an ice cream maker, but now I want one even MORE! What a fun experience it must have been to test out these recipes–they sound delicious (and look pretty darn amazing too!). OH… MY… GOODNESS!!!! Amazing, innovative recipes. Oh, those all look so amazing! I had better not get that book, actually, because I don’t know if I’d ever be able to stop eating ice cream! I am not much of an icecream person but these look superb and your photos got me wanting to be your personal test taster! sounds like an interesting book – does it have guidelines for people like me without an icecream maker? Not that icecream making is high on my list of priorities at the moment with the cold and rain but there are moments in summer when I get tempted! those totally look delish! I think you just sold a lot of people on that book! cocoa ice dream and graham cookies for me, please. I’ll be all over that book when it’s out, thank you for the heads-up Ricki. I love ice cream, but have to admit I’m a little timid about trying unique flavor combinations. Your blog has inspired me to step outside of my beloved cookie dough. You have me drooling here Ricki! I don’t think it would be easy to choose a favourite out of these flavours. Oh my goodness, I can’t quite decide what’s more gorgeous – the exotic flavor combinations or your beautiful, artistic photographic presentations! I am now even more motivated to seek out an ice cream maker… Thank you for the inspiration! On a different note, I absolutely love how you put the ice cream in a tea cup! So cute! Gorgeous photos as usual, Ricki, especially the avocado one! Yum! Why the hell did I give my ice cream maker away?! I’m crying over here. Those ice creams look amazing – i can’t believe you made your own graham crackers, they look so pretty!!! Yummm… now I want some ice cream! and this cookbook 🙂 I love trying interesting combinations I would never have put together! Oh, and a Donvier is fairly inexpensive, since it’s not electric–worked just fine for me. Yep, that was my problem, too. . . far too enticing! My pleasure. I love writing about books that I feel good about mentioning. And we really enjoyed all those desserts! Thanks for your comment, and for visiting! So glad to hear that this sparked the desire for something new. Let me know how the non-cookie dough flavors work out! Always glad to hear that the recipes spark some new cooking ideas! And I think there are also lots of ice cream recipes out there for which you don’t really need an ice cream maker. Aw, thanks so much! (I don’t use it for tea much, so I figured. .. . ). Thanks so much for your comment, and for visiting! As to the graham crackers, well, how could I resist, when the recipe was right there?? I am in sensory overload looking at this post! It all looks so delicious. And the graham crackers! Oh, what creative, innovative and delicious-looking sweetness! I am amazed at those Graham Crackers! I’ve tried making my own several times, but had the opposite problem that you had. Mine were never crisp enough. Are the graham crackers also from the Ice Dream cookbook? I’d love to have that recipe. Oh, man, those all look fantastic. I’ll definitely add that book to my wishlist. These are all enticing and your presentation is amazing. Love the gorgeous photos. Now I have to go buy an ice cream scoop and re-do mine! What a good idea to add the ginger. I have a question about the food values. Is the half-light one really more caloric than the regular? And are there truly 56 grams of fat in a serving of regular and 10 in the half-light? There are so many ways to enjoy ice cream (- the cream) and so many delicious natural sweeteners… thanks for sharing your adventures with these great sounding recipes! 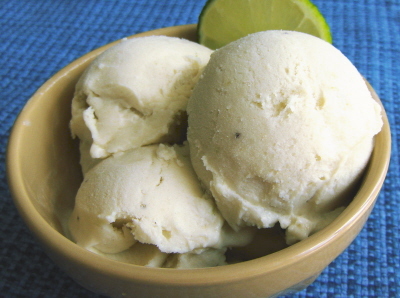 The Banana Daiquiri Ice Dream sounds great to me 🙂 The other day, I made a variation of this delicious simple Vegan Banana Nut Ice Cream Recipe with a friend in her electric ice cream maker: http://www.grouprecipes.com/57651/vegan-banana-nut-ice-cream.html We made it with bananas, yogurt, almond butter, maple syrup, and vanilla: yum! I’m curious: do all the recipes require gelatin or agar agar?